In 1947 Lesney Products was founded by Leslie Smith and Rodney Smith, the title of the company being formed from their names. The two were not related but were old school friends, both attending the Central School, Enfield. They lost touch during the Second World War but met again soon after being demobbed. Leslie had rejoined the firm he had worked for before the war as a buyer and Rodney had returned to his job with a diecasting company, D.C.M.T., in North London. Together they decided to start a company to fulfil their boyhood dreams. With a total of £600 they set up business in an old, run down public house in Edmonton, called The Rifleman. Rodney bought a diecasting machine from his old employer and they started making components for industry, with Leslie running the office. Shortly after starting work together, Rodney Smith introduced John (Jack) Odell to Leslie. Jack was a talented engineer who had purchased some war surplus equipment (lathes, milling and grinding tools) and who was intending to set up his own business. Rodney had met Jack while working at D.C.M.T. They came to an arrangement whereby Jack would run his own business from The Rifleman and contribute towards the £2 a week rent. He started to use his own machines to make industrial castings and also moulds for Lesney Products. He was quite successful and the two Smiths asked him to join them as a full partner. By 1948 Lesney consisted of eight employees and three partners. It soon became clear that the business coming from the industrial sector was seasonal with work drying up at the end of each year when companies reduced stocks prior to stock-taking time. Therefore something was required to bring in business during these lean periods. Late in 1947 a toy manufacturer placed an order for a component of a toy gun. This helped them over the period and sowed the seed for the later direction of the company. Perhaps anticipating the next year's lean period the business made some diecast models, similar to Dinky toys but at a cheaper price. The firm became a private company in 1949 producing toys and other diecast items. The skills of Jack Odell were amply demonstrated by the production of a large scale model of the Royal State Coach containing the figures of King George VI and his wife Queen Elizabeth I. However production of this model was put aside due to a ban on the use of zinc in toys (as a result of the Korean War). Following the end of the ban and with the upcoming coronation of Queen Elizabeth II in 1953, production of the model resumed but it quickly had to be altered when it was made public that the new Queen would ride alone in the carriage without her husband, Prince Philip. 33,000 of the large State Coaches were made and sold by Lesney. A miniature version was also produced with over one million being sold. Soon after this success came the idea for more tiny toys housed in replica matchboxes. Jack Odell's daughter was of school age and the school only allowed children to take into school a toy that could be contained within a matchbox. Most children took insects and other tiny things in their matchboxes. As Jack had been considering ideas for newer and smaller toys, he made her a miniature road roller out of brass that fitted inside a matchbox. All her school friends also wanted one so Jack made a mould and cast a few. Eventually he also found a matchbox from the Norvic Match Company of Czechoslovakia that contained the new toys better. Thus the "Matchbox" miniature 1-75 range was born. By 1954 Rodney Smith had left Lesney Products and was living in Australia. According to some sources he felt the company's focus on its toy lines (over the other production lines) would lead to its demise - a premonition that was to eventually be realised, but not for some decades. Leslie Smith and Jack Odell bought his share of the company and Lesney continued trading in their hands until it went public with a share float (at the recommendation of its accountants in order to avoid payment of a heavy surtax) in 1960. The "Matchbox" trade mark was originally registered by the toy distributor Richard Kohnstam. Up until now the toys had carried the Kohnstam "Moko" brand also. Following a threat to remove all references to Matchbox and Moko from the Lesney packaging, Kohnstam re-registered the Matchbox brand so that ownership rested with both Lesney and the Kohnstam companies. Finally in 1958/59 Lesney bought out Kohnstam as a result of complaints about his handling of some export markets and in order to solely own the name. All references to "Moko" were immediately dropped from the packaging. At the same time Lesney also bought out their sole distributor in the USA (Fred Bronner) taking control of the US distribution but retaining Bronner as manager of the US operations. In 1966 Lesney Products were awarded their first Queen's Award for Industry and were performing extremely well, employing 3600 workers and producing over 100 million models each year. However, by 1971 the company was suffering from the challenge of Hot Wheels to its 1-75 miniature range. The conversion of most of the line to the new "Superfast" wheel and axle system added significant cost to Lesney's operations but it continued to diversify into plastic kitset models, games, figures and carrying cases. By 1978 the writing was on the wall. Odell was called out of retirement by the firm's banker to assist but he was unable to halt the decline. In 1980 trial production was made in Asia (the legendary #76 and #77 in the 1-75 series) to determine if the toys could be produced at a lesser cost outside of the UK. Both models were completed on time and within budgeted cost. In June 1982 the end came. The Receivers were appointed to wind up the company and the name Lesney was removed from the list of actively trading UK companies. A holding company called Matchbox Toys was formed and by September 1982 the Universal Group, under the leadership of David Yeh, took control of all the assets after several other interested parties dropped out of the negotiations. The first production of a replica of the Royal Gold State Coach was in 1953, the year of the coronation of Queen Elizabeth II. Two versions were created, the first in a larger scale, followed by a smaller-scale model. It was this second model that sold over a million units, a massive success at the time. 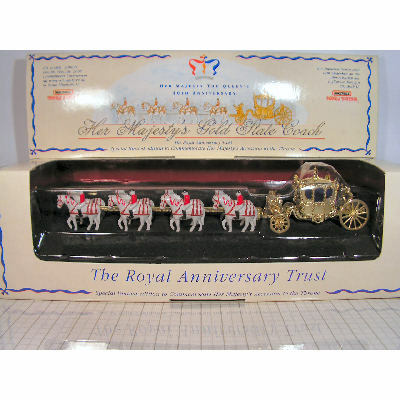 After Lesney became Matchbox International in 1991, it produced the Gold State Coach again for the Queen's anniversary which was released in September and October 1992. This model was in Matchbox’s Models of Yesteryear range, code number YY-66. I hope this helps you identify your coach - from your description and the length of time you have had it it is either the small 1953 issue of the coach or the later 1992 re-issue of the coach. The carriage is not that rare - I don't know where you are living but eBay is always a good place to work out what an item is worth if it is in absolutely mint condition. thanks again. thought i was going to the bank! it was fun . really aooreciate yuur time. maryann i live on long island Muttontown n.y.